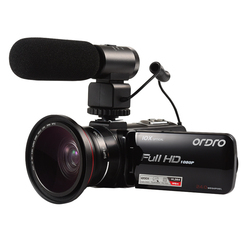 Home › Camcorders › Consumer Camcorders › ORDRO HDV-Z82 3.0 ..
Great . Love it. A+++. I do the audio-visual at my church in this is going to be great. record the delivery on my practice of purchases in ali. the seller, thank you very much. box is crushed, but only slightly, the total package, is described. the quality of work. the 5 stars. All right, arrived properly. I still don't know how it works, but so far so good. excellent machine and professional seller. ORDRO HDV-Z82 optical zoom hot shoe camera through 120x manual zoom can be effortlessly far away from the scene without affecting the quality of the details of the expression, whether it is shooting micro-film or video, you can increase the video playability.Using 1920 * 1080 (30fps) full HD 1080P video format, record travel landscape, allowing you to enjoy high-definition cinema-like video effects.3.0 inch touch screen, can be more convenient to use.Hot shoe function, you can connect a variety of external accessories, such as: LED ight, microphone and so on.